The initial step to fully embracing van life tends to involve a steep investment. 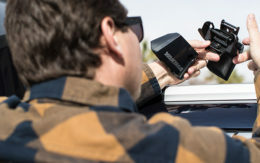 Whether opting for a pre-built van decked out with every on-the-go essential or outfitting one from scratch, expect to shell out some serious cash before hitting the road. Off Grid Adventure Vans of Gaithersburg, Md., wants to change that. The company specializes in conversions of the Ram ProMaster that cost on average $20,000 less than similar builds. It’s also developing conversions for the Mercedes-Benz Sprinter, Ford Transit and other new and used vehicles. Off Grid Adventure Vans offers two different van conversion packages, The Rogue and The Rogue 2. The Rogue, which starts at $32,500 (in addition to the cost of the vehicle) is the company’s base model and features a full-size Murphy-style bed, several storage cabinets and benches throughout the rig, hardwood flooring and natural wood walls, dimmable LED lighting and a Dometic brand burner stove, sink and refrigerator. The Rogue 2 costs $5,000 more but includes a wet bath and composting toilet, as well as a larger 9-gallon exterior-mounted grey tank. The standard Rogue features a 3-gallon interior grey tank. Both models also come standard with 120 volt, 12 volt and USB outlets in the front and rear of the vehicle, a butcher block countertop, 100-watt solar power, a MaxxAir roof fan and 5-pound propane tank. 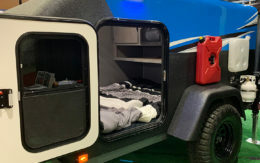 Off Grid Adventure Vans promises a two-month turnaround time for any of its conversions, and also has financing deals in place with Ram, Ford and Mercedes to help cover the conversion as part of the entire vehicle purchase. The company said it likes to work on Ram ProMaster vans because it’s the only vehicle in the segment that has front-wheel drive — the Ram also has a lower starting price than the Mercedes-Benz Sprinter van. Sustainable building practices are also part of Off Grid Adventure Vans’ agenda. It offers solar panels in each build to reduce fossil fuel use and to provide a clean source of electricity. Off Grid converts the vans at its facility in Gaithersburg, but will ship completed conversions anywhere in the U.S.